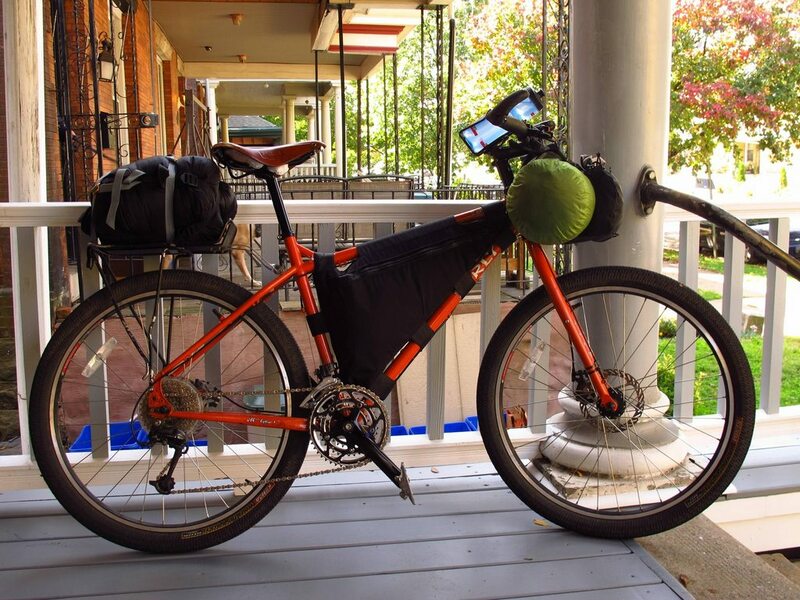 The frame packs are by Greg Wheelwright of Bolder Bikepacking Gear, and hold snacks and hygiene items (the smaller ones) plus tools, maps, food, stove and cook pot (in the main frame bag). 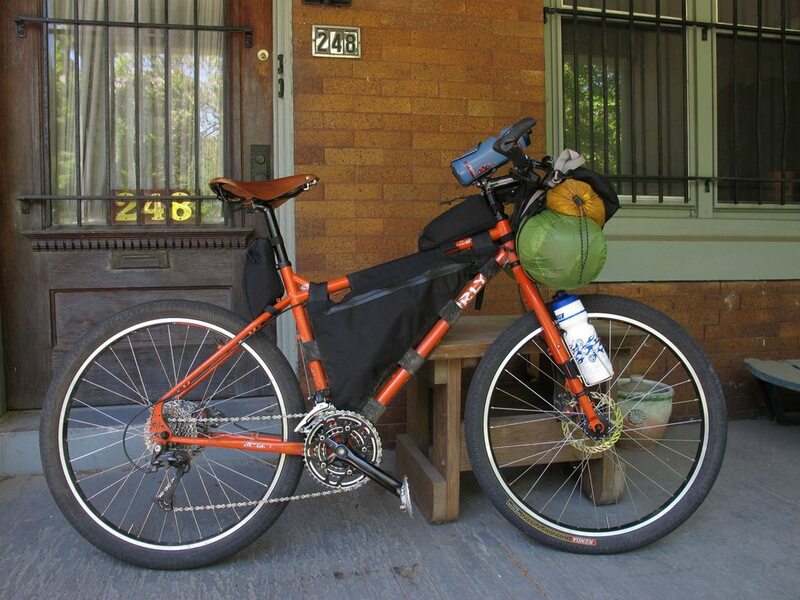 The handlebar roll consists of a dry bag held on by a Sling (unfortunately no longer produced) from Revelate Designs. In the fall setup, I had a reasonable amount of weight up there; in the spring setup, I was really pushing it. The Sling performs quite well for how flimsy it seems at a glance, but in the right-hand photo there, I had more weight on the bars than was ideal, probably upwards of 8 pounds. Handling wasn't dangerously bad, but it definitely got clumsy. In the fall setup, I was also compelled to wear a day pack (REI Flash 18; weighs 10 oz and rolls up tiny) to carry a rolled-up sleeping mat. Mats aren't great for hammock camping, as they diminish the hammock's comfort and, more importantly, tend to slide out from under you, exposing you to the cold. But hammock-specific underquilts are pricey. By May 2013, some gear purchases had enabled me to pare down the setup some: Instead of the bulky North Face sleeping bag, I have a much lighter and more compact down quilt from Hammock Gear. 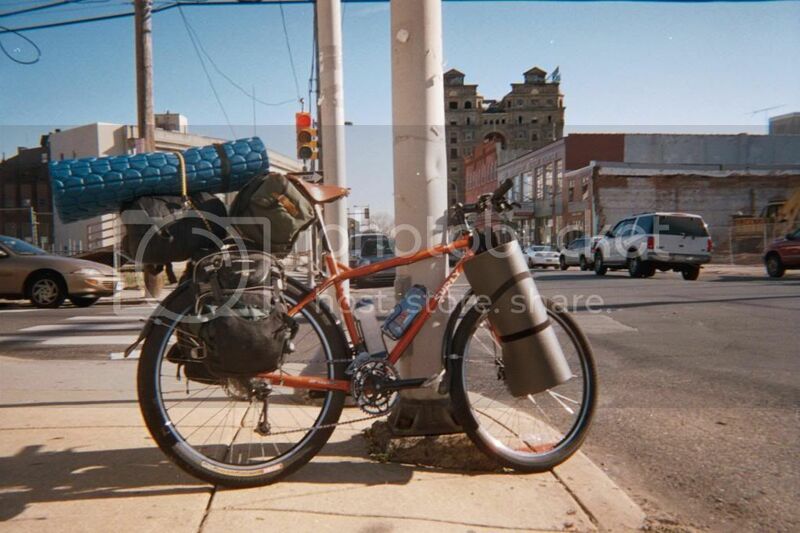 The spring setup required no backpack, to my delight. 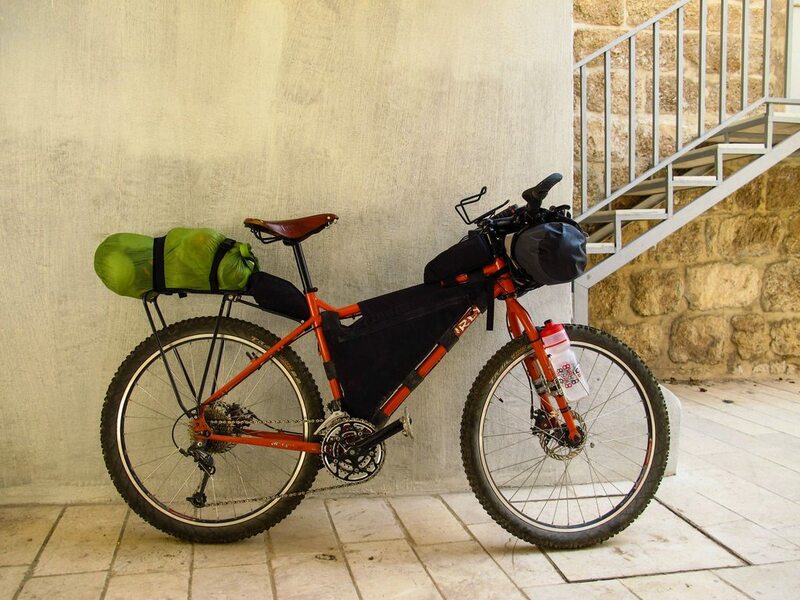 However, a more traditional bikepacking rig would have a large saddlebag, enabling me to take much of the weight from up front, and still have space left over; or I could just wear a small backpack and balance things out that way - I just hate riding with a backpack on. The Troll in these photos is pretty much stock, except that I put a Brooks B17 on there, and replaced the stock handlebar with Surly Torsion handlebars (more mountain-bikey than the stock cruiser bars it came with) and added Ergon GR2 grips - I've found Ergon grips indispensable for long-distance riding of any kind. The insanity pictured above somehow managed to get me out to the New Jersey pine barrens and back. How I maneuvered that monstrosity through so much soft sand is beyond me. I took a similar setup out to French Creek State park once, too, and even rode singletrack with it...although very slowly and not for long.